FACT or FICTION: Does Cutting Your Hair Make it Grow Faster? 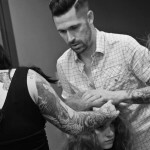 Home/Uncategorized/FACT or FICTION: Does Cutting Your Hair Make it Grow Faster? This question comes up in the salon a lot. To be perfectly honest, its a trick question. While cutting your hair regularly does not actually make it grow, it does keep it from breaking. Breakage is the number one reason women (and men) across the world cannot seem to get their hair to grow quite as long as they would like. If you are wondering to yourself: “Why isn’t my hair getting any longer? I haven’t cut it in months,” the answer is because you are destroying it from neglect. Hair grows 1/4-1/2 an inch per month on average. Split ends that go uncut, on the other hand, can equal inches of breakage. When ignored, split ends will split up the hair shaft causing additional damage and ultimately the loss of that strand of hair. It sounds like a no-win situation. If your hair grows 1/2 inch a month and your stylist cuts off 1/2 inch every 4 weeks… the math isn’t very hard to figure out. So whats the solution if you want your hair to grow? Every 6-8 weeks get 1/4 inch trimmed off your ends. You can also prevent split ends by using less heat on your hair, conditioning it with the proper bottle, and protecting those fragile ends with a leave-in conditioner. If your hair is growing at a snails pace, check your diet. Everything you put into your body eventually comes out in your hair (why do you think they clip strands for drug testing?). Eat a well balanced diet and drink lots of water. The extra hydration helps to keep your follicles lubricated and good food will nourish your hair at the root. So the short version of my long winded answer: Fiction. Cutting your hair certainly does not make it grow, but it does make it longer. I told you it was a trick question.